DAVID BEN-GURION. 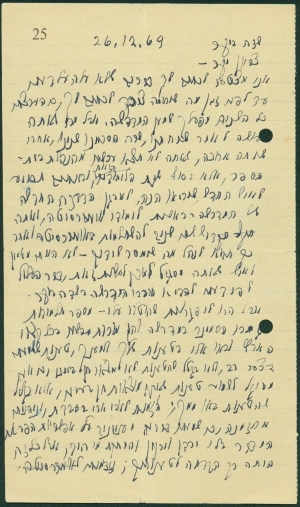 Autograph Letter Signed, to Avraham Zvion, December 26, 1969. 2 pp. 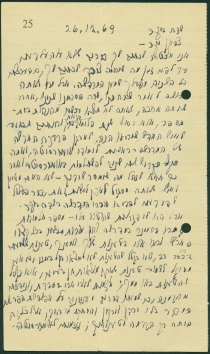 in Hebrew, on off-white faintly-lined sheets 4&frac78; x 8&frac38; in. I’m sorry for writing you things that until recently I hadn’t realized that I would be required to. That’s because I have admired all these years the work you’ve done for the Midrasha. However, your actions following our conversation, when we both agreed after a long discussion, that you won’t be leaving the school’s management right now but only at the end of this year, and meanwhile you’ll assist the new person that will be assigned here to prepare the new education program for the Midrasha – initial university studies. You will then take two years off as education leave, and afterwards will retrieve the management of the Midrasha. I wouldn’t have believed anyone that you are capable and ready to do this, an action that in my opinion may bring the destruction of the Midrasha in Sde-Boker. But I have had meetings. Several female students, that have recently graduated the teacher seminar in the Midrasha, and now became fresh teachers all over the country, came to me to voice support for your claims. I heard these claims with a great sorrow, not because I didn’t like it, since I’m capable of hearing claims I dislike. I was upset because those claims came from you. You invited me to Even-Ari in Avdat, and I enjoyed your invitation, since I heard interesting things about the feasibility of fertilizing the desert without Yarden, Yarkon and not through desalination of sea water. But all of this was just a preparation for your claims. I happened to arrive <2> at the parliament for a few moments, and two good acquaintances came to visit me. One of them is a teacher Levin, who is nowadays a member of the parliament, and you recruited him to stir up the Teachers’ Union against the Negev Committee. The second person, who has earned a respectful position in our modern history, is a lawyer Klausner. You summoned him to prosecute the Negev Committee. Although I honor your activities in the Midrasha and I do not have an authority to intervene in its management, as a citizen I feel an obligation to do so, since this enterprise that you managed to raise to such a level, might be sacrificed in your war against the Negev Committee. During the last meeting I spoke to you, and you came up with three new demands, claiming that if they are accepted by the Committee, you’ll agree to leave for studies at the end of the year. At the meeting I did not want to acquiesce to these propositions, but I could not understand how you came up with them and how it goes along with what should be done with the head of the Teachers’ Union and with Mr. Klausner. I do not know if there is any value in my writing to you nor do I think that my sorrow will change your mind. However, as one who cherishes and admires your work in the development of the Midrasha for more than five years, I feel an obligation not only towards the Midrasha, but also to you, to tell what lies on my heart. Please do not bring the destruction of the Midrasha! Following David Ben-Gurion’s vision to build a university in the Negev desert, the construction of Midreshet-Ben Gurion began in 1963. The Midrasha was founded as a governmental corporation which owned the campus and ran all municipal affairs. The Negev Committee, headed by Ya’akov Ya’akovson, operated as the board of directors. 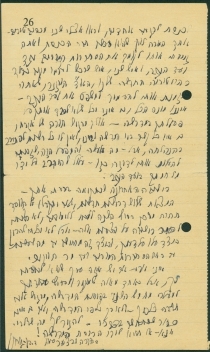 In 1964, the Negev Committee assigned lieutenant-colonel Avraham Zvion to become the principal of the Midrasha. With heart and soul, Zvion built a vigorous community reaching over 1,000 members. He started several different specialized schools (i.e. high-school, teacher seminars) and recruited excellent teachers to join and promote the enterprise. Despite his unquestionable achievements, Zvion’s character was harsh, and he did not take well to critics. After a dispute, the Negev Committee decided to let him go. Zvion recruited the head of Teachers’ Union (and a member of the parliament) Shalom Levin to sue the Negev Committee, utilizing the services of the attorney Klausner. Zvion also had dozens of fresh teachers, recently graduating the Midrasha teacher seminar, on his side. While approached by several of Zvion’s supporters, and feeling great appreciation for his achievements, Ben-Gurion was greatly upset that Zvion’s actions against the Committee might destroy the Midrasha. Zvion left the Midrasha in 1970. Michael Even-Ari, mentioned in the letter, is a famous botanist. In 1959 he founded a research farm at the ruins of Avdat, an ancient Nabatean city. His work, explaining how the Nabataean culture was able to supply thousands of inhabitants in a similar arid climate with early runoff rainwater management, was crucial for modern Israeli agriculture.